SSM Health Cardinal Glennon Children's Hospital and Stratasys Open Doors for Advanced Medical Innovation with 3D Printing in "Center of Excellence"
MINNEAPOLIS & REHOVOT, Israel--(BUSINESS WIRE)--Dec. 11, 2017-- Stratasys (NASDAQ: SSYS), a global leader in applied additive technology solutions, today announced it is teaming with SSM Health Cardinal Glennon Children’s Hospital in St. Louis, Missouri to launch an advanced 3D printing “Center of Excellence” – designed to accelerate innovation in pre-surgical preparedness, medical research and patient treatment. Open now, the center leverages Stratasys 3D printing technology to develop and share best-practices throughout a range of specialties including neurosurgery, orthopedics, cardiac treatment, as well as hand and cranial maxillofacial reconstructive surgery. Cardinal Glennon Children's Hospital leverages the Stratasys J750 full-color, multi-material 3D Printing solution to accelerate medical planning and treatment (Photo: Stratasys). Listed by U.S. News and World Report as a “Best Children’s Hospital,” this nationally-ranked pediatric academic medical center fully invests in the latest technologies to serve medical needs of children today and tomorrow. At the foundation of this commitment is Stratasys 3D printing technology, encouraging SLUCare (the physician practice at Cardinal Glennon Children’s Hospital) doctors and surgeons to explore new approaches for advancing patient well-being. SSM Health Cardinal Glennon currently leverages the Stratasys J750 3D Printer – the world’s only full-color, multi-material solution delivering unmatched material versatility and realism. The Stratasys J750 3D Printer enables medical facilities to build highly realistic, patient-specific anatomical models with consistent color results and lifelike textures. Based on PolyJet technology, the system combines both flexible and rigid plastics in a single print to accurately mimic hard bone and soft tissues. Fine resolution recreates minute details such as thin vascular walls, while blended transitions and transparencies consistently produce anatomically correct properties. 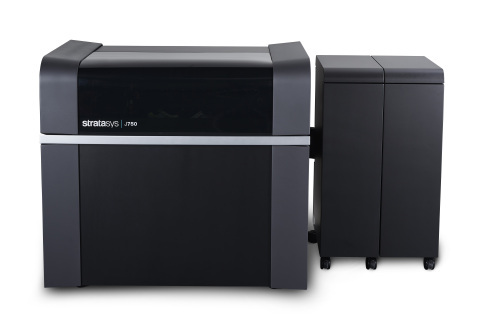 Stratasys is a registered trademark and J750, PolyJet and the Stratasys signet are trademarks or registered trademarks of Stratasys Ltd. and or its subsidiaries or affiliates. All other trademarks belong to their respective owners.